June, the month where Winter arrives and I reluctantly retire my Summer wardrobe for another year. This month it's been all about the eyes with these four fabulous products being on high rotation. 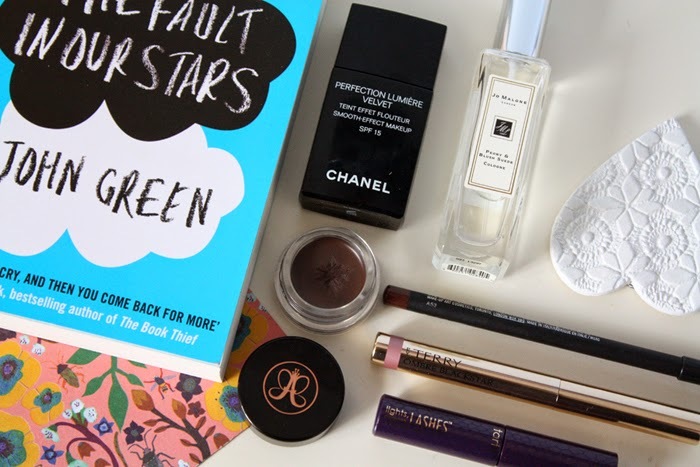 There's also a new base love, a perfume I can't get enough of and the book that I just can't stop reading..
Anastasia Beverly Hills DipBrow Pomade-Strong eyebrow game in a jar. This gel-mousse hybrid leaves things looking a lot more natural and a lot more polished. The product itself is seriously pigmented so a little goes a long way. Once this sets in place it stays put all day. It's amazing stuff. Mac Kohl Liner in Teddy-We all know about Anna and her enabling ways. I was actually helping a friend buy makeup when this fell into my hands after spying it in this post. Don't leave me unattended in Mac.. Teddy is a dark brown with a touch of copper to it. Think of it as the dolled-up sister of Coffee, also from Mac. I like to apply this close to the lashline and then smudge it out with a brush for a more lived in look. Again it stays put all day and its creaminess means it would work well as an eyeshadow base too. Love. Chanel Perfection Lumiere Velvet Foundation-My experiences with foundation in the past have been dismal. Too orange, too dewy, too cakey. Then I met Perfection Lumiere Velvet, PLV for short. Combination and oily-skinned gals you will love this. Its matte-velvet finish counteracts redness and shine. It has buildable coverage and a shade range which is more in favour of paler complexions. It'll be a sad day if this ever gets discontinued. Jo Malone Peony and Blush Suede Cologne-If you were a fan of the Daisy fragrances back in the day but want something a bit more grown up then this is the scent for you. It's floral but not in an intoxicating, sickly way which I think is in part thanks to the notes of red apple. Go have a sniff of it at your nearest Jo Malone but be warned, you will be wanting everything from this scent's line. Tarte Lights, Camera, Lashes Mascara-Tarte and mascaras+blushers clearly seem to agree with one another. This mascara leaves your lashes looking fuller and a lot more volumized. I've even been asked if I was wearing falsies when this was on. It's perhaps not as dramatic as 'Lights, Camera, Flashes' but it still leaves your lashes looking pretty darn amazing. I will have to get the full sized tube some day. The Fault in Our Stars by John Green-If you're yet to jump on this bandwagon where have you been!? I think the fact that I have read this book three times this year speaks volumes about how much I love it. The story itself, about two cancer-stricken teens is beautifully tragic. You will laugh, you will cry and feel all the feels. By Terry Ombre Blackstar in Misty Rock-The eyeshadow crayon best reserved for treat yo'self and feeling spendy occasions. Why? It is rather expensive. Price aside, these eyeshadow crayons are stunners. They're long-wearing, unique, beautiful colours. Misty Rock has been my go-to shade all month for a reason! Go swatch them and see for yourselves. *What products have you been loving during June? The Anastasia DipBrow sounds amazing - whereabouts did you get it? I also love the sound of the MAC eyeliner and the Chanel foundation!! I really want to start reading that book but I don't want to spend the next week or so crying! It's awesome Hannah! I bought mine from Cult Beauty but apparently it's slightly cheaper on Beauty Bay. You'd probably suit the shade I have but look at swatches. You must start reading that book! Do it. Read it in a day and get it over and done with.